We have a winner! (I used the number generator random.org to pick the winner). I am keeping it hush-hush until tomorrow morning---to give the winner time to respond. If I receive no response by 8am FRI PST, then I will need to quickly ping a runner-up (all in the name of getting this beautiful kit to someone in time for their promised baking regimen!). Stay tuned. Just in time for Valentine's Day: A Cookie Kit from McCormick. I just opened my kit yesterday and they have promised to send a kit to one of my readers! (We will be matching cookie kit twins!). 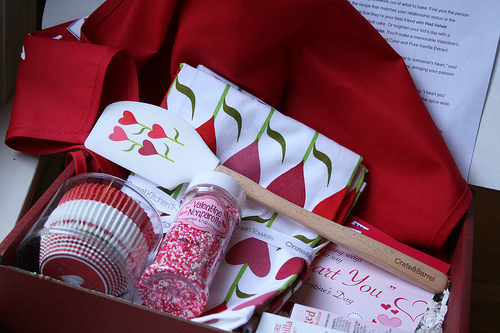 Inside the kit: all sorts of Valentine goodies, including towels and a rubber spatula from Crate & Barrel, Valentine sprinkles, vanilla extract, red food coloring, cupcake papers, cookie cutters and a tiny kid's apron. And they include two recipes for Red Velvet Cupcakes and 'Vanilla' Chocolate Chip Cookies. Want to make yummies for your honies? Now is the chance to win this kit! Just enter a comment below, tell me who you plan to bake for and/or with! I will randomly select from the comments---must comment by Thursday 7pm PST (Feb 10). I know: that's tomorrow! Please swing back to Talk of Tomatoes on Thursday after 8pm or before Friday 8am (why? to see who won and to make sure I have your address for your Valentine Cookie Kit).